Kashmir Festival inaugurated at Srinagar. 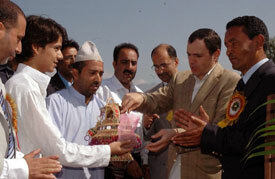 Chief Minister Jammu & Kashmir, Omar Abdullah inaugurating two day Kashmir Festival at Srinagar. Srinagar October 10 - “Tourism is one of the vital sector of our State, particularly in Kashmir valley and what is required is to bring it back to its glory so that we are able to reclaim the number one position in global tourism pyramid”, said Chief Minister, Mr. Omar Abdullah while inaugurating the 2-day Kashmir Festival in order to promote heritage tourism of Kashmir. The Festival was organized by Tourism Department in collaboration with Information and Public Relations, Handicrafts, Cultural Academy, JKTDC, Floriculture and Horticulture departments. On this occasion, Minister for Tourism, Mr. Nawang Rigzin Jora, Minister of State for Tourism and Culture, Mr. Nasir Aslam Wani, MLA, Zadibal, Mr. Peer Afaq, Commissioner Secretary Tourism, Mrs. Tanveera Jehan, Director Tourism, Mr. Farooq Ahmad Shah, Managing Director, JKTDC, Mr. Satesh Nehru, tourism traders, trade agents and houseboat owners were present. The presence of distinguish personalities from tourism trade, members of Chamber of Commerce, Media and artists from different parts of the valley added charm to the festival. Mr. Omar also took stock of the progress of regaining the old glory of world famous Nigeen Lake. He inspected the tourism heritage park recently built across the Nigeen club. On the occasion, the Minister said that the main objective for organizing Kashmir Festival is to enhance the summer tourism season and showcase the culture, heritage, art, craft and beauty of Kashmir Valley. The Minister said that this year Kashmir Tourism Festival was a symbolic one and added that in future 10 to 15 days Tourism Festival would be enlisted in the tourism calendar so that all the stake holders would involve themselves in this mega event every year and will be a bonus event to the visiting tourists in month of October. Referring to the development of Tulip garden in the lap of Zabarwan hills, the Minister said that this international recognized garden have pre-poned the summer tourist season by one month and added that the same way organizing of Tourism Festival in the month of October would also help our travel agents to extend the stay of tourists upto end of October. Recalling this experience in Ladakh region where the tourism department organized 15 days Ladakh Festival in the month of September helps the tourist travel agents to extend it upto 15th of October which helps to boost the economy of the area. The Minister said the department has already identified the areas to harness other resources fully for which Rs. 25 crore have been sanctioned for the preservation of heritage sites in Srinagar city. He said the tourists have different classes and it is our duty to provide basic infrastructure and awareness about the particular class to the tourist whosoever wants to visit J&K as per their choice. He said that we are working to take necessary steps for enhancing the winter tourism in J&K also. Minister said that the thrust should be given to provide world class facilities to the new tourist destinations and spots already identified by the tourism department to enhance stay of tourist in the valley from four days to twenty days. He said the other areas where we have to focus is on domestic tourism as the purchasing power of this class of tourist have increased manifold. He said for this purpose, the department has already made a comprehensive policy to divert the pilgrimage tourists from Katra to valley and other parts of the State.